"Bear Holiday" has just returned from a 3 year trip around the Great Loop with her current owners. They have made several upgrades to her standard equipment making her the perfect platform for extended cruising. 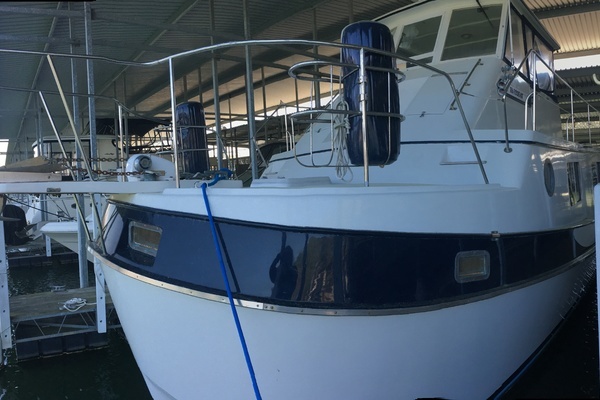 If you are in the market for a well maintained and upgraded trawler, "Bear Holiday" should be on your short list. Entry into the salon can be from the side-decks, mid-starboard or aft-port. If entering from starboard, the wooden wheel and nav station, with adjustable captain chair, is forward and the u-shaped galley is aft. On the port side, just forward of the door is the dinette, with removable and adjustable table that converts to an extra bunk; bar w/ basin to your right (aft) as you enter. The salon area is light and spacious with large windows all round and attractive, planked-teak finish. A large shelf beneath the front windows provides space for books and belongings; storage below the settees and in the galley is plentiful. Access to the engine and generator is gained by lifting the central floor boards or they can be reached by removing the stairs that lead to the fore and aft cabins. The U-Shaped galley is located on the starboard side of the main salon and offers all of the storage that a cruising couple could ask for. The galley features a large Norcold refrigerator/freezer, Magic Chef 4 Burner Propane Stove w/ Oven and Double Stainless Sink with H/C pressure water. The aft stateroom serves as the master suite and is equipped with it’s own private head. Here you will find a large island queen berth, storage both outboard of the berth and underneath. A large vanity is to starboard and a very large walk-in storage closet to starboard equipped with hanging space and drawer storage. The private head features a shower/tub combo, updated electric Raritan head and a spacious marble vanity with sink. Much like the aft master stateroom there is seemingly storage everywhere you look. Sleeping accomodations are provided by a large V-Berth with filler cushion. Aft and to starboard of the V-Berth is a large hanging locker that it is currently being used as a mechanical spares and tool storage area. Aft and to port is a large private head which features an updated Raritan electric head as well as a marble vanity with sink. The forward head is a “wet” head as it does not have a separate shower stall. Hot water heater 10 gal. The engine is a Yanmar 6PHM-TE which is a turbocharged diesel engine rated at 145 HP. This is an industrial grade engine that has been marinized. The normal longevity of this engine is 10,000 hours between rebuilds and currently has just over 4,000 hours of use. The original owner of Bear Holiday was a dealer for John Deere equipment and many engines of this type had been installed in John Deere equipment giving him special knowledge about this engine. Over the past 7 years several components have been replaced including the turbocharger, the raw and fresh water pumps. The fuel injection pump is scheduled to be rebuild in October 2017. Although many Yanmar dealers are not familiar with this model of engine none have had any problems working on it. Operator, service and parts manuals are all on board and are available electronically. Bear Holiday cruises at about 8 knots with a fuel consumption of just under 3 gallons per hour. This workhorse of an engine has many good years ahead of it.